Among the traditional cancer treatment technologies, removing the tumor tissue by surgery is the most efficient and effective way. However, in clinical treatment, there are many patients who cannot bear surgery due to special situation or unwilling to take surgery. What’s more, surgery brings high surgical risk, large trauma and pain to the patients. How can we achieve similar surgery efficacy without taking surgery? The answer is MWA cancer treatment. According to Professor Peng, MWA is to introduce the microwave ablation needle into the tumor percutaneously under the guidance of ultrasound B and CT and other imaging devices and then the needle produces microwaves. 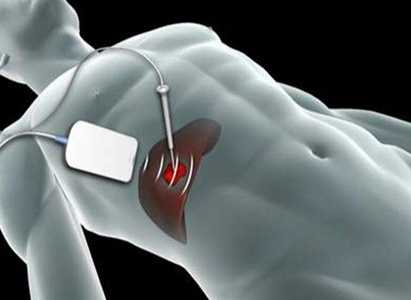 At this time, the microwave ablation needle is equivalent to a “mini-microwave”, which persistently releases microwave. Polar molecules in the tumor tissue have high-speed movement under the action of the microwave field, generating heat so that the temperature quickly rises above 60℃ in the tumor tissue, resulting in tumor tissue coagulation, dehydration and necrosis within short time. Thanks to the high thermal efficiency of MWA, the operation time could be short. Usually it takes 10 minutes to ablate 6cm tumor and kill the tumor sized less than 5CM one-time in situ. Thus, MWA can help reduce the risk of surgery and patient’s suffering and in the meantime its efficiency and effectiveness of killing tumor is comparable to the scalpel. In clinical treatment, the MWA can also be combined with interventional chemotherapy and other minimally invasive treatments to have a comprehensive treatment for cancer. Its unique thermal drug effects can promote blood circulation and contribute to absorb medicines in large amount to get drug-inflammatory detoxification in the cancer site, achieving a better effect than individual treatment. Therefore, the clinical application of MWA means a new era of minimally invasive cancer treatment has come. At present, Modern Cancer Hospital Guangzhou has successfully introduced and implemented Microwave Ablation treatment of tumors, achieved terrific effect on the treatment of liver cancer, lung cancer, thyroid nodules, breast cancer, bone cancer, uterine cancer, pancreatic cancer, kidney cancer, etc. Microwave Ablation Treatment performed under CT imaging device.